1. Preheat the oven to 350°F (176°C) and line a 9×13 pan with parchment paper or aluminum foil, with enough sticking over the sides that you can use it to remove the bars from the pan later. 2. To make the blondie base, melt the butter in a microwave safe bowl, then transfer to a mixing bowl. 3. Add the brown sugar and whisk to combine. 4. Add the vanilla extract and eggs and whisk until well combined. 5. In another bowl, combine the flour, baking powder and salt. 6. Slowly add the dry ingredients to wet ingredients and mix until combined. 7. Spread the batter evenly into the prepared pan. Set aside. 8. In another small bowl, make the cinnamon filling. Combine the brown sugar, cinnamon and melted butter. 9. Drop/drizzle the filling over the top of the blondie and run a toothpick around the top of the blondie batter to drag the filling around and incorporate it into the top of the blondie. 10. Bake for 18-20 minutes, or until the edges are lightly browned. 11. Remove from the oven and allow to cool. 12. To make the icing, combine all ingredients except for the powdered sugar in a small sauce pan. Heat on low until sugar is melted, then turn heat to medium to bring to a boil. 13. Boil for 3 minutes, stirring occasionally, then remove from heat and immediately pour into a heat-proof glass bowl. 14. Slowly whisk in the powdered sugar until thick enough, but still thin enough to drizzle, and allow to cool slightly and thicken. If you find your icing to be a little thick, just add a touch more water to thin it back out. 15. 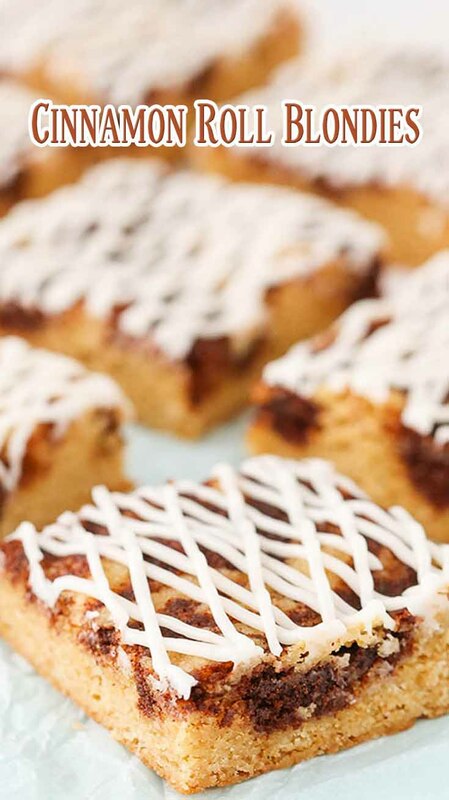 Drizzle the icing over the blondies, then use the paper lining the pan to remove the blondie from the pan. 16. Cut into bars and serve.